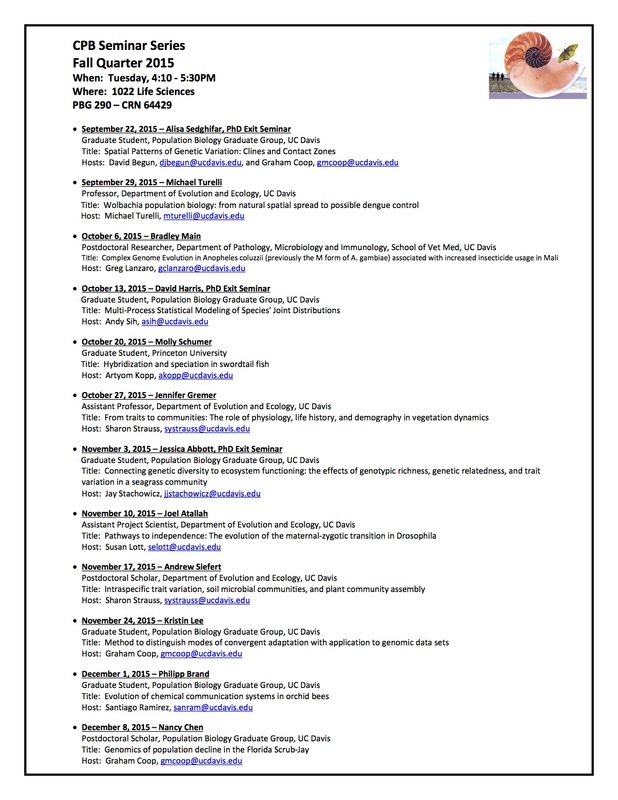 Please find attached the Fall Quarter 2015 CPB Tuesday Seminar Schedule. Seminars will be held as usual, 4:10pm in 1022 Life Sciences. Please note that the series starts just prior to the actual first day of Fall Quarter ’15 instruction. So the first seminar is this coming Tuesday, September 22nd with Alisa Sedghifar’s PhD Exit Seminar. Author Jonathan EisenPosted on September 17, 2015 February 3, 2019 Categories Seminars and TalksTags Misc. Next Next post: Breakthrough method in microbial ecology: fMRI analysis of ordination plots.